I'm still becoming acquainted with my iPad and its uses. I'd like to share some of the ways I'm using it to create art (subject to my limited abilities), write and blog. I welcome suggestions below by other writers and artists; I'm still debating about the best diary/journal app to try. Here's the apps I'm using as a writer, (not very skilled) artist, and blogger. I'll be updating this page as I try more, especially since my Mom is currently betatesting a new art app that she's raving about. 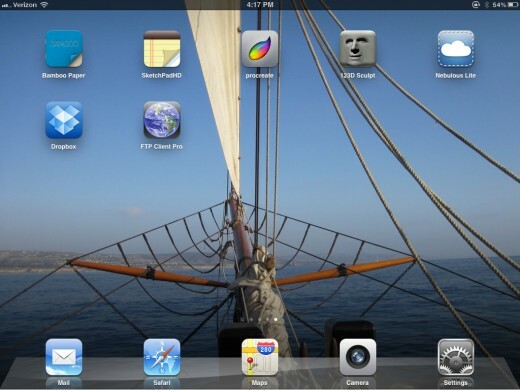 Need to take a screenshot of your iPad, as I did below? Press the Power/sleep switch at the top right edge of your iPad (in portrait orientation) at the same time as you press the "belly button" (main button with square on it). That saves the current screen to your camera roll. You can transfer apps, iBooks, video and music between your computer and iPad using iTunes, but for some reason you can't easily port photos back and forth. I suspect Apple will fix this sooner or later, but in the meantime, to upload images from your iPad to your computer, you need DropBox. DropBox is a FREE file transfer app. How it works: You sign up for a DropBox account with a username and password. You'll then get 2GB of free storage space (you have to pay for more than that) on DropBox.com. You can then sign in from the website or get a free DropBox Application (for your computer) and DropBox App (for your iPad) that let you upload and download any files to the dropbox. What if you want to upload images from your iPad to your self-hosted website, or a website that allows FTP? Then get FTP Client Pro (NOT free, but reasonably priced) which lets you log into your website (address should be ftp://website.com or whatever your website is) and upload/download files to it on your iPad. Bamboo Paper by Wacom (yay!) is a FREE drawing sketchbook with extremely limited, yet pleasing, tools: a nib pen brush that changes darkness/thickness according to pressure in a way that feels natural, and a sort of wash/tint brush. It detects and filters out when you rest your hand on the screen. It looks pretty good drawing with the fingertip, but a stylus is better. The free version gives you one notebook and a set of background papers (white, lined, graph, or calendar/appointment style); the paid version gives you multiple notebooks and the ability to share them with other Bamboo Paper app users. Pros: FREE, really smooth drawing tool feels more intuitive and natural than any other I've used; great for drawing diagrams, equations, taking handwritten notes. Cons: Very limited set of colors, no way to free-select colors with a slider. When you choose a paper background (lined, white, graph), it's set for the whole notebook, which goads you into buying the paid version to get multiple notebooks. After trying out several drawing apps, I can't quite explain why, but the pen tip on this one feels more natural and seems to place the line and thickness exactly where I'd expect. Too bad there's not more art brushes and colors. 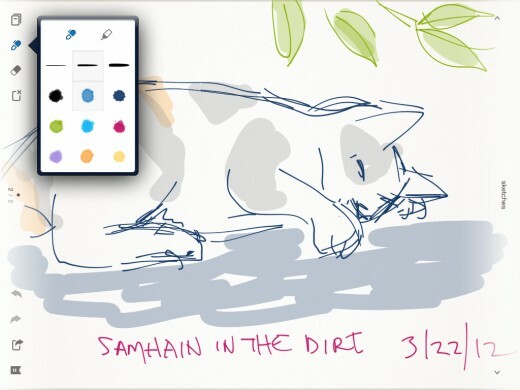 Paper is a beautiful, free sketchbook app for artists, but it may also work as a notebook for jotting down notes, diagrams, ideas. It comes with a realistic ink pen tip and eraser; you may purchase other tips like pencils, markers, watercolors. I'm still getting the hang of Paper. Its controls are hidden: drag up from the bottom, or drag down to hide. Undo is a gesture: put two fingers on the tablet and circle left to "rewind" brush strokes. 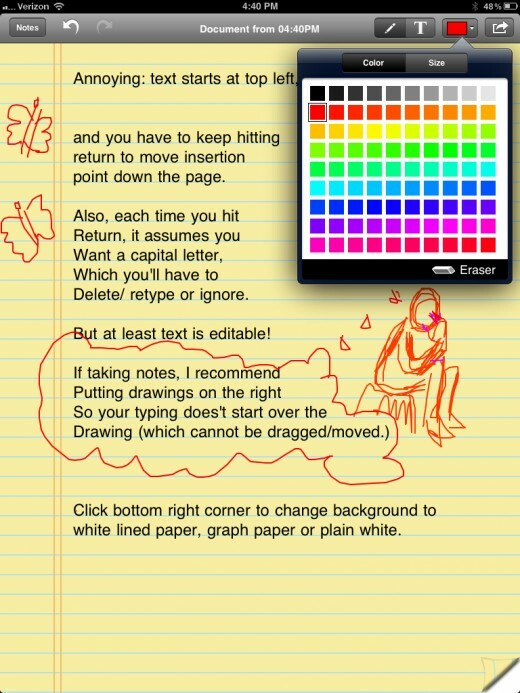 The limited color palette (see screenshot) may be blended on the paper as if laying down strokes of color. There's debate in the user forums about whether to add more colors. It's worth downloading, since it's free. Give it a try to see if it works for you. 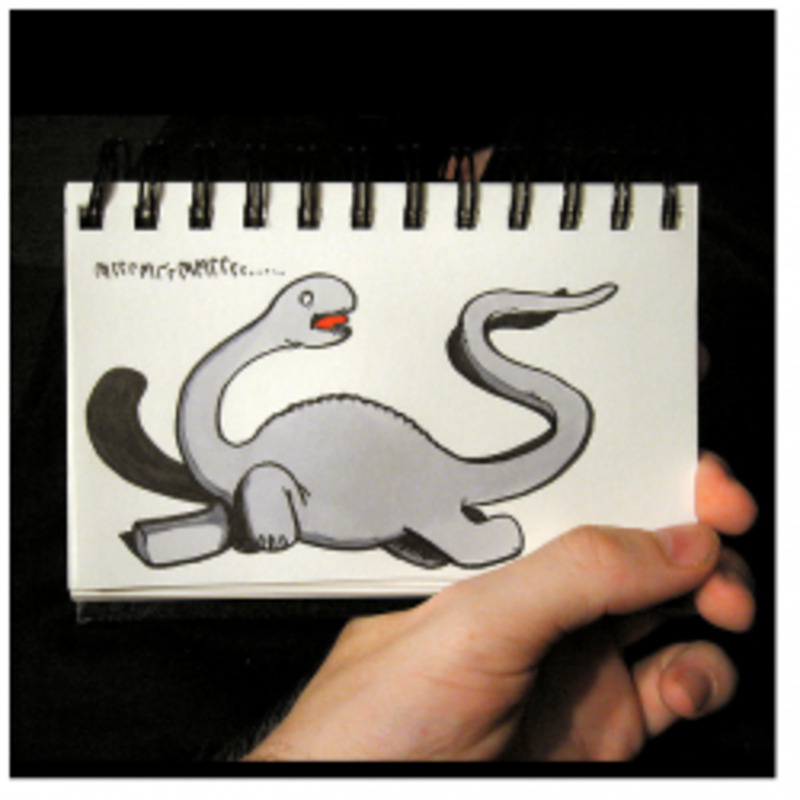 SketchPadHD is an award-winning iPad app that lets you combine drawing and text. It's a paid app, but cheap. It still doesn't have a freeform color picker or extensive brushes, but pen nib sizes from pixel up to about half an inch in diameter. You can set individual pages of the notebook with different backgrounds. I find it a bit frustrating that the text starts at the top left-hand margin. You have to use spaces and returns instead of just clicking an insertion point elsewhere to start typing. But as you can see, this app is a lot more flexible for planning, note taking and design, because you get editable text plus drawing / diagram capability on the same page. 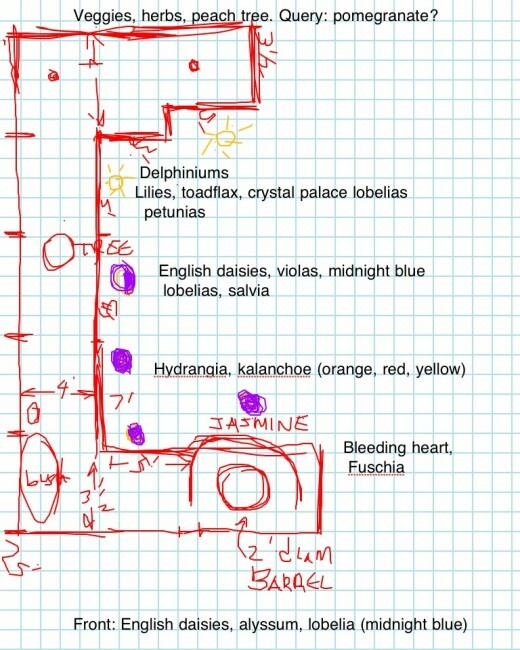 I'm still looking for a journal program that lets me import camera pictures, draw, and put a text insertion point anywhere on the page, mimicking the old journals in MYST and RIVEN (which have been re-released for iPad, huzzah). Feel: like drawing on a whiteboard. A bit clumsy with the tip; that might just be me. It also includes arrow keys to move the insertion point forward or back a word. You can save text documents or save them to DropBox, but it doesn't let you create folders on your iPad (you can on DropBox). 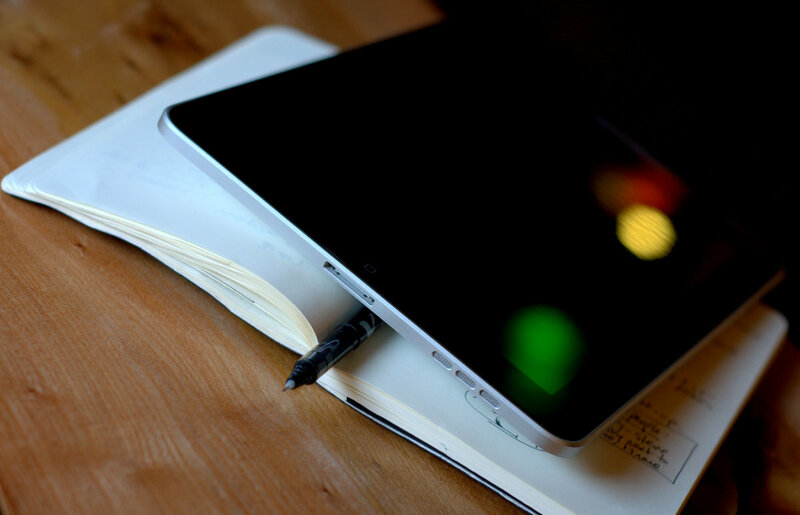 So it wouldn't be a great program for writing a whole book -- organizing drafts and chapters might be a chore -- but for writing a post before you upload it to your blog, forum, or a site that lets you post content, it's the tool to use. Select all, copy, and paste into the text window on your web browser. The iPad art app I'm using is Procreate. It lets you have up to six (?) layers, setting the opacity of each one to let those below shine through, and the toolbox lets you import a photo. 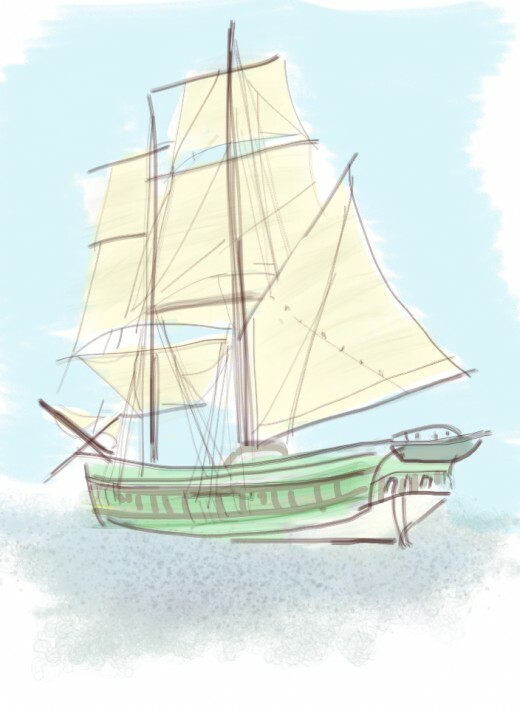 Here, I used one of my photos of the Lady Washington in the background with opacity turned faint, drew on layers above, and then hid the photo (a technique known as "onionskinning"). There's a smudge/blur tool, and unlike the other programs, you can set the opacity/pressure as well as diameter of this and the eraser. There's a full range of brushes, chalklike, brushlike, penlike, airbrush and spatter (see water at right); one can change brush opacity; and there's a color picker as well as swatches so you have a full spectrum. It will export to your camera roll as a transparent PNG. It looks a little weird in the camera roll, which puts a black layer behind it, but it looks fine when you upload it to the web. It might be a good idea to put a bottom white background layer, just to make sure. TIP: choose the wrench at top and pick "Set artwork orientation" if you're working in portrait mode (taller than wide). I found that FTP Client Pro uploaded my ship 90 degrees on its side when I left it to guess. Setting orientation fixed the problem. Feel: like drawing with all the brushes and layers in Photoshop, or a very stripped-down version of Painter. 123D Sculpt is a FREE 3D rendering app for those of us who were goofing around with Bryce and Raydream in the 90s. You start with a ball of virtual clay (or, optionally, a preshaped blob like a dinosaur or a head) which you can pinch, dimple, layer more clay on, and otherwise distort. It includes decals which you can rub on at varying opacity -- eyes, fur, feathers -- for some bizarre effects, or it's got a color palette and brushes. You can spin your sculpture around and view it close/far away in a way that staggers me, since I remember the days when it took hours to render a shape like this. When you're finished playing it around, save it in a gallery, take a screenshot of it, or upload a video of it turning around to YouTube. Like most art tools, in the hands of a master, you could do amazing things with this program, but in the hands of a clod like me, it's still relaxing to sculpt and paint odd abstract shapes. Acase(TM) Stylus - A-ccurate Slim Stylus Pen for Touchscreen Devices Including Kindle Fire, Apple iPad/iPad2/iPad3, Motorola Xoom, Samsung Galaxy Tab, BlackBerry PlayBook (Jet Black). No iPad stylus is perfect, because they have to be soft enough not to scrape off the conductive coating on the screen. So the tips tend to be soft and rounded rather than a narrow point. This one is pretty good. 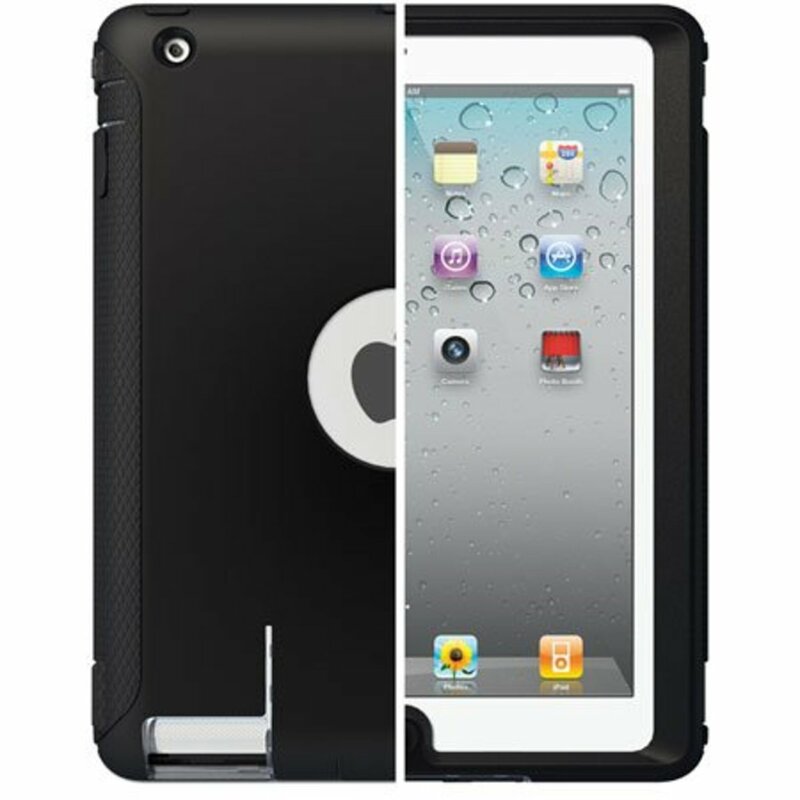 I keep it clipped on the outside of my iPad case so it's always handy. 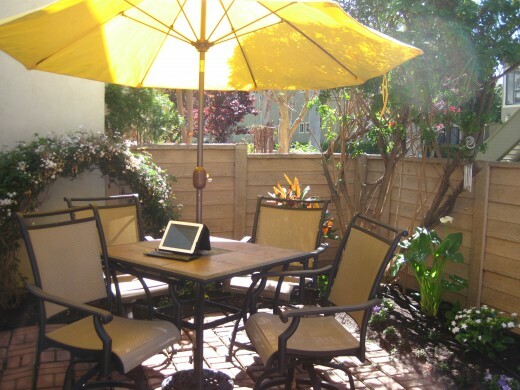 But before you buy this one, watch the MacWorld video review of stylus options below. It sounds like some of those are better! I'm thinking of taking up drawing on the iPad, but some people don't consider any work done in a digital medium to be "real" art. Maybe I will take up artwork in both digital and traditional materials . I'm wondering on the iPad if the small size makes it feel somewhat constraining. 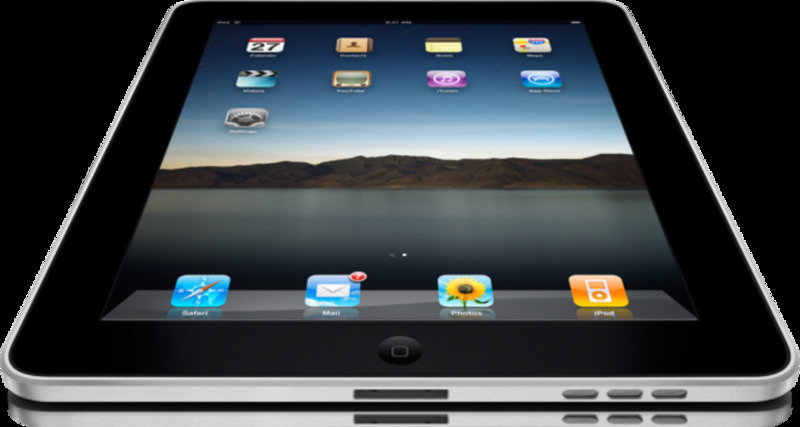 There are rumors of apple coming out with a larger iPad soon. I love these! I'm going to get the Bamboo paper one right now. Thank you for this hub. Excellent list of apps for creatives. Heh. Now if I just were better at collaborating with other people! But I'm sure many creative people do, and would find that app useful. Thanks for the rec! The only one I use that's here is dropbox lol. I have been thinking of getting a stylus for my ipad though. I'd love to be able to write and draw in it naturally. My fingers are too big so they're not working for me lol. Got a chuckle out of the fact that I am using about half of these apps already--which means I am probably on the right track to become a better creative thinker and designer. Thanks for providing screenshots for the other apps. Currently a user of Bamboo, and love it. 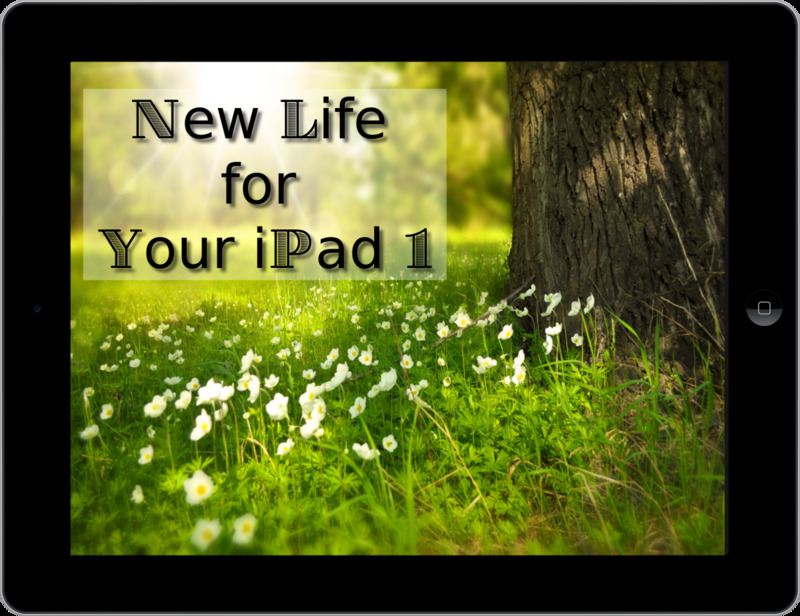 Great hub on a great set of apps for the IPad! 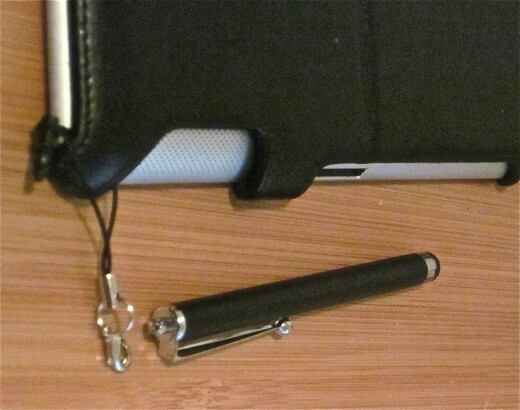 I always wondered why one might need a stylus for an ipad, but it makes sense now. thanks! 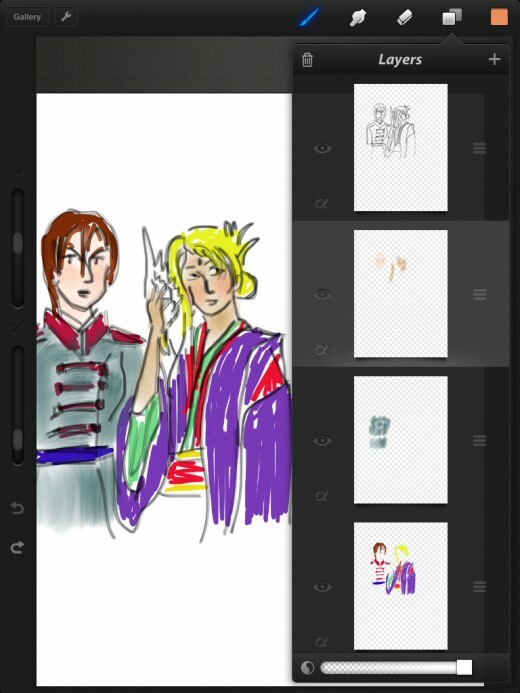 Swipe up from the bottom gives you the colours and other drawing tools. The extra brushes cost a few dollars each, which is how they're making money from the app. If you pinch on the screen, you can choose a new page or notebook. 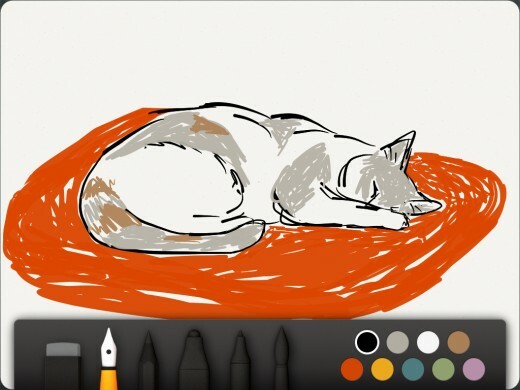 Have you tried out Paper for the iPad yet? It's a very well designed app and it's fun to create art within it. Great hub, I am a huge ipad fan, and use many of these techniques, if not the same apps. Flickr andDropBox are great for sharing content without wires, and you can do a lot with graphics as well as maintaining web content in hubpages and wordpress. I do all my business and all my really creative work on my desktop. But I'm noticing more and more that my iPad can do quite a bit with all those apps that are available. No need for a separate laptop anymore, which I basically use when traveling. Thanks for writing about these additional nifty apps that I didn't know about. Thanks! I need to find out what my Mom's using; she picked up an early version of some art App and got in touch with the developer who's working on a new version and getting her to betatest. Thank you for the software reviews, Greekgeek. I'm thinking about getting an iPad, and I love playing with art programs, so your hub was very useful.